An outside view of the Salt Lake City Public LIbrary's Marmalade branch. Photo from Moca Project Management. I met with Heather Hart, who will be acting as my on-site supervisor for the duration of my internship. She showed me around the Creative Lab, which will constitute part of my internship duties. The goal of the Creative Lab is to act as a resource for the community to explore different technologies, and receive help from knowledgeable librarians and volunteers about any piece of technology ranging from the Adobe Creative Cloud, to the recording studio that we have onsite, to “analog” technologies such as typewriters. The Salt Lake City Public Library (SLCPL) system also has several 3D printers that are popular with patrons and the community. Heather and I discussed the objectives of my internship, which fill focus mainly on digital inclusion and digital literacy access for all patrons. 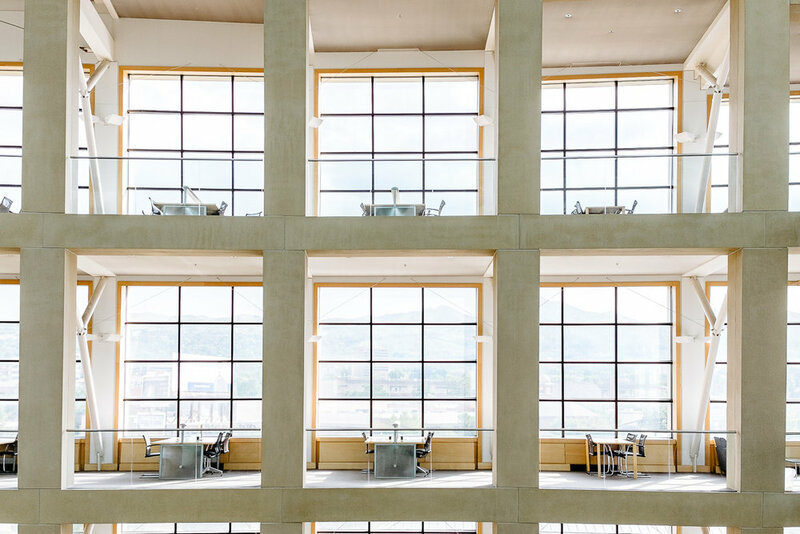 This is a multifaceted approach that will consist of a few different projects for the library, all with the goal of improving the user experience in the library’s digital and technological realms. Some of the projects that I have proposed include cataloging for the vast digital library using the metadata that I have learned in grad school, and creating a survey that assess the accessibility and information architecture of the library’s website. A special project that I am very excited to work on with the Digital Inclusion Librarian, Shauna Edson, includes creating instructional materials for the library and its community partners as tools for them to learn how to interact, and work effectively, with members of the community who have low tech and general literacy rates, or a nonnative speakers of English. All in all, I am very excited to be working with a library that gives so much care digital literacy and digital inclusion in the community. 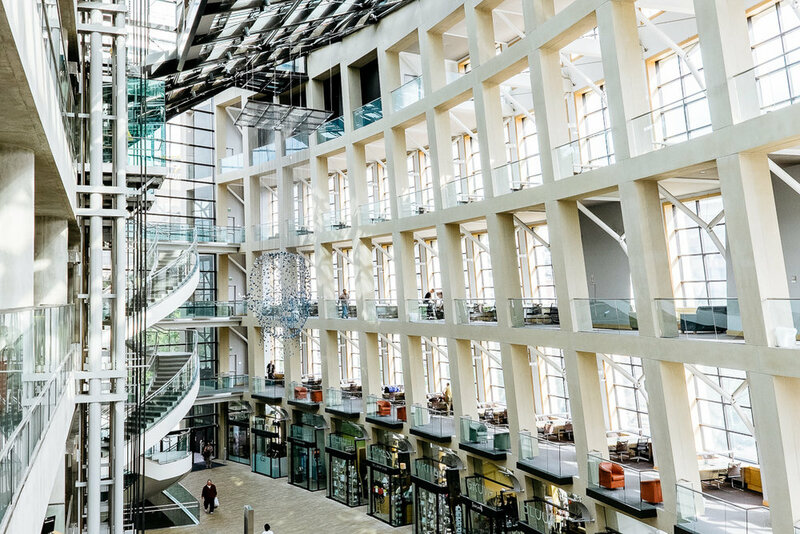 Inside the Main branch of the Salt Lake City Public Library. Photo by Jonathan Grado. Today I am in the Creative Lab at the Marmalade Branch of the SLCPL. I was able to give hands-on assistance to several patrons interested in the workings of the Creative Lab. I assisted a patron in troubleshooting Adobe Photoshop and drawing with the Wacom drawing tablet, another in getting started printing a project on the 3D printer, among others. A librarian is hosting a free photoshoot for professionals and creative types to obtain a free, professional headshot. It’s a program that runs about once per month and always fills up. I assisted with setting up and completing the photoshoot. I am still waiting on stakeholder approval to begin the instructional design and digital library projects, which will get started in the New Year after the holidays are over. The coffee bar at the Marmalade branch. Photo from Moka SLC. I started creating some instructional materials for the Creative Lab. There is a one-page instruction sheet for using the 3D printer, but I wanted to improve on the look and feel of the instructions, as well as creating “how-to” guides for other materials in the Lab. My goal in creating these guides is to serve as a reference point for both librarians and patrons; I think the need is there more-so for patrons to be able to feel successful in completing a technological task. I also worked with a few patrons on basic digital literacy questions in the Lab. Today I am continuing my work on the instructional materials. I am using a web-based graphic design application called Canva to create the materials. It was important to me to match the library’s style and feel - they have a very modern, unique edge to their marketing materials - and Canva is a great way to give a professional graphic design-feel to documents. My day was broken up by working with patrons in the Lab. Today was a slower day in the lab, but I still had some great interactions that I feel form the basis of a positive experience in the library. I very much believe that user experience has as much to do with the physical space, as well as the technological space. Today I spent the majority of my time working on my instructional materials project. The instructional design project that I am working on with Shauna will be finalized in early January after the stakeholder meeting. So for now, I am still working on the physical user experience of the Creative Lab. The start date of the instructional design project keeps getting pushed back as stakeholders are slow to finalize what they are looking for in the materials; this is a common issue with a large instructional design project as it requires several people to sign off on the process, I am eager to get started however. I did not have any visitors to the lab today, so I spent some additional time doing research into digital literacy in library settings and how to best work with all populations in encouraging these areas. The 3D printer was not operating at an optimal capacity today so I spent some time troubleshooting the issue; the filament was not extruding properly and required some careful finesse working with the filament and the software to get it to flow smoothly again. The 3D printers are fairly new, and much easier to use than the older 3D printers, which makes them user-friendly for the most part. After fixing the issues, I resumed my research into digital literacy and digital inclusion. It is the day after Christmas, so the library is very quiet today with not much traffic. Another quiet day at the library! I have seen a lot less traffic during the holidays than I usually do during the week. I was able to find several interesting and relevant research articles that I am pulling together into a literature map. I intend to include this research in my final internship write up/MLIS portfolio as a way to help support the decision to open areas of the library such as the Lab (I’ve heard other libraries call similar offerings a “makerspace”). The manager of the Marmalade Library, Safi Safiullah, was named Librarian of the Year in May 2017 by the Utah Library Association for his efforts in increasing community engagement, digital literacy, and education. Most of the Labs in the SLCPL system have been open for only 1-2 years, so educating the community about what we can offer them in the Lab is a challenge that we are working on to increase engagement with the Lab. It seems that one of the most difficult parts about developing new library offerings is making sure there is enough staff to support the initiative, and marketing the project appropriately so as to inform the community. I am personally very inspired by Safi’s work - he has an incredible life story - and I am very glad to have the opportunity to intern in his library. I have been emailing back and forth with Shauna, the digital inclusion librarian that I am working with on the instructional design project for refugees and digital literacy outreach efforts for the library. I am waiting on the final stakeholder meeting before work can begin on the official materials, so I have mainly been assisting patrons in the lab while I wait for the go-ahead on the project. There is a lot of interest in the 3D printer; and we try to make it an educational experience for the patrons who are interested in printing something, rather than just printing them a cute knick-knack and telling them to come back soon. Today I worked on researching issues in digital and information literacy. I am interested in this topic as it relates to my work in the lab, and to my impending work on the instructional design project. I am working on materials that need to be accessible for a very broad range of skill level - so the design of the materials needs to find that balance between being accessible and challenging without being patronizing (as many of the users of the finished project will be adult learners). It’s a brand new year and I am really looking forward to what the library has planned for its yearly goals. We are just a few weeks out from final approval on the project - I found out that the Salt Lake City Public Library has partnered with the International Rescue Coalition (IRC) as stakeholders in this instructional design project. I am even more excited about the potential range of users that this project could reach. Today I have been helping patrons as they come in to the lab - most of the patrons I end up assisting aren’t sure what a “Creative Lab” is, so I get to spend a few minutes explaining the purpose of the lab and showing them all of the different technologies and tools that they have access to. Many patrons are pleasantly surprised to find out that they have access to expensive tools and software products such as the Adobe Creative Cloud, but that they can also check out a sewing machine and print something from the 3D printer as well. I continued my research into issues and trends in digital literacy in the library setting today. I also started outlining some ideas for the project, started designing some handouts and signage, and assisted patrons as they came into the lab. Today was - what has become - a fairly typical day for me during my internship. I usually spend a part of each day doing some research, outlining some projects, and assisting patrons. Today ended with the fantastic news that the final stakeholder approval has been made and the project is a go! I met with Shauna to discuss the details of the stakeholder approval. She showed me the materials that they were currently using, and we talked about different ideas to update the content - both in its accuracy and in the look and feel of the content. I proposed using Rise - a web-based instructional design software designed by the Articulate Storyline family of products. I showed her a prototype of what a finished product in Rise would look like, and she loved it. We also discussed how we would test the final materials with real users, so that I could adapt any content, formatting, or flow as necessary. There are three weeks of material to develop, with each week divided into two “paths” - one for basic digital literacy and the other for intermediate level learners. I went into Rise and made a rough draft of the different modules I was expecting to be in the final product. There are three weeks worth of material, and each week is divided into two “paths” - one path is for basic learners, and the other path is designed for beginning to intermediate learners. In total, for the three weeks of materials, we will end up with six total modules. Each module will stand alone, and will feature objectives, several lessons, interactions, activities, and links to outside materials (quizzes, videos, etc.). I am anticipating that I will recreate several images from scratch; there are several images that I imagine are supposed to function the way an infographic would, but can be confusing and many look outdated. I started developing some material for the first week’s module for the Basic Path today. The first week on the Basic Path focuses on the most essential parts of a desktop computer: the computer case, the monitor, the keyboard, and the mouse. This module features clear photos of each item, as well as a description. The module starts off with short video explaining the basic parts of a computer. There are also descriptions and photos of the different variations a mouse can have, such as a trackball mouse, a standalone trackpad, and a laptop trackpad. I also included links to some outside sources that provide free, open-source resources for typing skills and a tutorial on how to use a mouse. I worked on building an interactive keyboard activity today. This will be included in the week one module for the Basic Path. The activity features a large image of a keyboard with several labeled points on the image. Learners are able to click on each icon and a short description of that part of the keyboard will pop up. For example, I might highlight the “delete” key with an icon, and learners will be able to read a short summary of what the delete key is capable of. This interactive activity is going to be alongside several typing and keyboard tutorials to further assimilate that knowledge. The content I developed today involves a lesson solely based on turning a computer on and off, and logging in to the computer. The three basic objectives for the lesson were to to learn how to: 1) Turn a computer on and off; 2) Log in and out of the computer; 3) Shut down the computer when you are done. The lesson includes a short video that discusses and demonstrates all three objectives. Learners are then presented with an interactive card-based activity to review what they have learned. There are five cards displayed on the screen with key words from the lesson such as “power button” and “log in”. Learners are instructed to study each card and write down the definition on a piece of paper. They are then instructed to click on each card; the card will flip around on screen and display the correct definition. Continuing on with the content development today for this project. I am really enjoying my time spent working on this material. I was trained as an ESL instructor through my undergraduate studies in linguistics, and I hold a current TESOL. I had forgotten how much I enjoy developing material for nonnative speakers of English and this project has been a perfect pairing of helping learners in a library setting as well as drawing upon prior knowledge. Today I created a module on navigating around a computer using a keyboard and a mouse. This lesson included several objectives: from accurately using the mouse to perform single clicks, double clicks, and right clicks, to dragging and dropping items on a desktop, to using drop-down and scrolling menus. There was a very old infographic describing the different click functions of a mouse, so I started with re-creating that. I included outside links to different keyboard and mouse practice activities for learners to work through as well. I am working on developing a drag and drop interaction, but that will require some additional time. The lesson that I was converting to eLearning today was the most extensive one yet, and probably the most difficult to teach as well. It was an introduction to operating systems. I found it challenging to have to describe abstract concepts such as a computer’s “memory” and how to “communicate with the computer”. I kept the lesson as high-level as possible, but I will be interested to see how this lesson performs when I start testing these modules with live users. To try and explain the high-level concepts as thoroughly as possible, this module includes a combination of videos, photos, text, and outside links to practice resources. I developed another interactive activity today that introduces learners to the basic components of a computer’s desktop. This particular activity focuses on exploring a Mac OS X desktop. I included a large image of a desktop with icons calling out desktop functions such as the start menu, how to open a folder, and accessing the menu bar. This interaction is a preparation for a more in depth look at Mac OS X operating systems and desktops in the next lesson. There will be a companion lesson that will feature a second desktop interaction that looks at Windows desktops and will be followed by an in depth look at Windows operating systems. The module that I worked on today is titled “Getting to know Mac OS X” and is a more indepth look at how this specific operating system works. Learners were prepared for this detailed lesson by the introduction to operating systems, and the exploration activity where they were able to interact with a Mac desktop. This module has objectives ranging from being able to identify parts of Mac OS X, to opening and using files, to deleting files, to adjusting settings, and finally to shutting down the computer. I included videos, tutorials, and photos to create an interactive learning experience. I began the second half of the operating system activities today, this time focusing on the Windows operating system. I started by creating a learner interaction where they are able to explore a Windows desktop through labeled icons, similar to the activity developed for the Mac OS X modules. In the introduction course to operating systems, we mentioned Mac OS X, Windows, and Linux. We won’t be developing any specific materials for the Linux systems, however, due to the complexity and the variability of Linux. With the first module almost being complete, I emailed Shauna (one of the main stakeholders) with an update on the project and a link to view the progress I have made. She was very pleased with the project, especially with the improved visual design. The old material, while effective, was clunky and difficult. I am really glad she approved of my work thus far! The second part of the Windows module focuses on building on the knowledge from the introduction lesson, and the interaction activity, to give learners a broader scope of the operating system. Like the module focusing on Mac OS X, this lesson features videos, tutorials, photos, and text for a well-rounded learning experience. I am not sure if I have mentioned this before in this log, but in general these modules are taught by a library volunteer in a one-on-one setting with the learner. The volunteer is there to help explain difficult concepts in more detail if needed, and provides an extra level of learner engagement and communication. At the end of the Basic Path there is a short tutorial on how to translate pages into the learner’s native language if they need to draw upon that resource after the Digital Readiness sessions have ended. I didn’t get any visitors in the lab today, so I had plenty of time to work on my instructional design project. I finished up the Windows operating system module, and went back through all of the existing content that I have developed to add some additional photos. I edited several sections for clarity and included some new activities as well. It is eye-opening (to say the least) to try and explain concepts that I have started learning in early elementary school to an adult learner who has had little to no exposure to modern technology. Concepts and knowledge I have taken for granted I know how to try to explain, and attempting to describe what an “operating system” is in a digital learning format is … challenging. Luckily, there are fantastic amounts of information, such as beginning tutorial videos from open source educational platforms, that I can draw on for inspiration. I spent most of today continuing to edit existing modules. When I am editing, I am mostly looking at how I can rework the material for clarity - both in the actual content, and also in the organization and flow. There might be one section that would be more useful in an earlier section, for example. There were several large blocks of text that I parsed down to one smaller paragraphs and bullet pointed lists rather than having huge swaths of content taking up the majority of the page. Large blocks of text are typically a barrier to absorbing dense information, so I am attempting to break up areas where lots of text is needed with photos depicting images of what I am describing. Today I developed on a couple of modules that focus on working with files on a computer. It is a simplified lesson on opening files and applications (both from a desktop and from the drive by searching for them), adjusting the settings on a computer, and shutting down the computer when you are done. Because these are fairly abstract concepts to describe, I used several screenshots that I took on the computer to illustrate both what these files and applications look like, and the step by step instructions of how to work with them. I am continuing the work that I started on Thursday - designing a module that teaches how to work with files and applications. On Thursday I focused mainly on instructions for working with files and applications on a Windows computer, and today I am working on a how to work on a Mac. The basic steps are essentially the same, but the navigation differs depending on the operating system the learner will be working on. Screenshots were again very useful for illustrating these differences - I am assuming that I will be relying heavily on screenshots as a main teaching tool for this initiative. I finished off the lesson with a short tutorial on how to shut down your computer - this is again something that will be different based on the operating system. In speaking with Shauna about this digital literacy initiative, it seems that many learners are at the very beginning of their digital literacy journey, and several are just beginning to learn English as well. I am anxious to test out this material to see how accessible it really is and where it can be improved. I am moving on to a lesson about understanding the sound and audio options on a computer. This is one of the lessons that might be severely cut down after I receive feedback on the material. The lesson is fairly in depth in terms of explaining audio ports, buttons, and slots on a desktop. I think the efficacy of a module like this will depend heavily on how much experience the learner has with working with the physical parts of a computer - plugging in headphones, USB cords, etc. To facilitate learning, I included a short video on sound and audio parts, as well as several photos to give the learner visual aids to connect the learning to a real-life object. It might be handy for volunteers to have props with them when they work through these lessons with the learner. Work stations at SLCPL. Photo by Jonathan Grado. Today I created what I like to call “exploration activities” - high-resolution photos of an object or a concept that learners can explore by clicking on “hotspots”. The hotspots each feature a short description of that area/concept when you click on the indicator. The two activities feature a photo of a front of a computer case, and one of the back of a computer case. The hotspots describe key components of each object, such as the USB port, where you can plug an audio cable in, etc. I hope that this (somewhat) hands on activity will give learners a more real sense of what these objects look like and function, rather than just reading about them and looking at photos. I am finally at the end of the first week’s worth of material! The first week has the most material out of the three weeks. The material was also the most challenging to work with and make accessible for a wide variety of learners. I have peeked ahead at the two remaining weeks, and the material is not half as lengthy or challenging to create (in my opinion). Each week also features two “paths” (one is more introductory) so for each week I am actually creating two lessons. I will have a total of 6 modules when I am finished. The second part of week one included some of the same lessons as the introductory path, but was much less intensive because learners are supposed to be aware of basics such as different operating systems, working with files, etc. To finish off the first week, I made a short lesson that featured a few “assignments” for learners to complete. They include signing up for a library card, some links to activities to practice typing and mouse skills. Today I started the material for week 2. This week focuses on the internet - learners will explore identifying internet services providers, connecting to the internet, internet web browsers, and correctly identifying address bars and URLs. Each “path” will also feature a substantial amount of content devoted to email - correct ways to send, receive, organize email, as well as managing email, and email safety. Thursdays can occasionally be the busiest days in the Creative Lab, usually because of the children who are interested in something fun to do while they wait for their parents to pick them up after school. Today is one of those days. I spent a good part of my time today creating buttons, starting some 3d printing projects, and showing kids how to use a typewriter. I got a few minutes worth of work done on week 2. I am working on a lesson dedicated to how to navigate the internet, namely, how to navigate (forward, backward, and refreshing) a webpage, using hyperlinks to get to other pages, creating tabs and moving between tabs, and downloading and saving files from the internet. Continuing with the lesson on internet basics, today I created several sections of the lesson that focus on navigational buttons featured on an internet browser. I was reluctant to include as many screenshots as I did, but it was excruciatingly difficult to describe something like the “back button” on an internet browser without an image. Every day I spend working on this digital literacy initiative is a reminder of how many concepts I take for granted are not universal. I very much consider these lessons as “first drafts”. I want to continue improving these modules even after I am finished with my official internship. I see so many areas where the content can be fleshed out, areas where the content can be reduced or simplified, and areas where the usability can be improved. I had a few visitors in the Creative Lab today; after they had left, I started on some modules for the internet safety section of week 2. I think this is one of the most important sections of the whole week. This module is all about blocking internet ads, preventing viruses and malware from infecting your computer, and learning how to avoid falling for internet scams (such as phishing emails or sites that might prompt you to provide financial information). I started with how to block internet ads by using browser extensions like Adblock Plus. I included a short video on browser security and some crucial details on security symbols and browser updates. I am also planning some content that will feature a couple of exploration activities to explore a phishing email. I worked on a lesson called Email 101 today. The objectives of this lesson focus on exploring email versus traditional mail, how email addresses are written and how to use them, and how to analyze the different email providers to choose the one that is best for you. I made a custom infographic for this lesson, and included some simple interactive features (such a checking off boxes as learners read through a list) that will hopefully keep learners more engaged with the material rather than just reading pages and pages of content. The email providers we are highlighting are Yahoo!, Outlook, and Gmail. There will be more in depth lessons later on in the material that focus exclusively on how to use Gmail, so while all three are given as options, Gmail will be the primary example for later modules. This email module is quite long and will feature several different components and activities; I didn’t finish today but will pick up where I left off on Saturday. I started in on the Email 101 module again this morning. I am creating a lesson that revolves around the common email features - this is where Gmail will start to feature prominently in the Email materials. There are obviously many, many email features, but we wanted to keep it to what learners might need on a regular basis. Even so, this material is fairly detailed - covering even how to color code emails. It starts off with an explanation of the email interface such as an overview of the Inbox, and what it looks like when you compose a message. All of the examples are Gmail (as I have previously stated) so while most email providers use a similar interface, it may not look exactly the same if a learner chooses to sign up with an email provider other than Gmail. I created two activities to complement the Email 101 modules today. Both activities include are a “labeled graphic” activity - where an image is featured showing several callouts that learners can click on and learn about that section. I created one labeled graphic activity to explore the Compose Pane and one to explore the Message Pane. I called specific items in the Message Pane such as the To: field, the Body of the email, what an email address looks like in a message, Cc and Bcc, the Subject line, formatting options, the Send button, and several other features. The Compose Pane activity was dedicated to showing an email chain, plus other email standards such as the Inbox, Reply, Forward, and Compose buttons. I hope these two activities are useful to learners; being able to explore and visualize the real thing is always more helpful than only having static screenshots or text. I am still working on the Email section for the second week’s worth of material for the digital literacy initiative. The instructional material I designed today is all about how to respond to email. You might not think that a whole lesson could be devoted to this (or maybe you can!) but I was surprised at how complex an email response really can be when you look at it objectively. The objectives were to identify read and unread messages in the inbox, open an email attachment, forward an email to another person, and create an automatic reply. I started with a short video about how to respond to an email using Gmail. The lesson is heavily focuses on providing step-by-step instructions (with an abundance of screenshots for illustrative purposes) for how read your email, open attachments, replying to an email, forwarding an email, viewing or minimizing emails, and adding a vacation reply. I also included an Email Challenge for learners to perform a task using an email in their inbox (from their account they have previously set up). Learners will practice all of the tasks they learned about in this lesson. Another Email day! I am moving on to the material on how to manage your email. This lesson covers everything from deleting unwanted messages, archiving old messages, applying labels and organizing emails, and how to filter and search for emails inside Gmail. The structure of this lesson closely follows the structure of the lesson on how to respond to email. Learners will have accessed their real Gmail accounts several times by this point, but the lesson still relies heavily on screenshots so that learners can make the connection. I am trying to engage the learners in a variety of interactions for them to explore the content. The lesson concludes with another Challenge; this one will build on the previous lesson’s email Challenge. There are two more lessons for week 2 (and both are on email). The lesson I designed today was on safe email practices. The last lesson will be another exploration activity that looks at identifying a phishing email. The majority of the content in the Email Safety lesson is dedicated to being able to block and report suspicious emails, filtering out suspicious emails, and turning off email images that might be malware. “Spam” might be an abstract concept for some learners to grasp. The exploration activity attempts to illustrate what one example of a phishing email looks like, but of course there are several different kinds of phishing emails and they get more realistic everyday. The activity notes that learners should look at the email address, and watch out for requests for money or information. I have a few user testing sessions planned with other library users, but I might not be able to meet with a learner before the end of the internship. When I am able to meet with a learner, I will have a better idea of how much of this material is accessible. Yesterday, I finished the last two units for week 2. Today I started the material for week 3; this final week is dedicated to using Google Drive and basic information literacy. It is a fairly short week in terms of the amount of material, but I can already identify several areas where the material could be expanded in the future. (This will likely be a task I take on post-internship.) The first lesson for the week tackles basic commands; this would be more in line with the information literacy portion of the week. By “basic commands” I mean being able to use the Menu bar at the top of an application (such as Word), cut, copy, and paste text, and undoing changes. I also developed an introductory lesson to using Google that looks at how to search on Google and starts delving into interpreting results. I met with Shauna today to review the majority of the instructional design project and to discuss our next steps. We discussed potentially putting together a proposal to present this project at the Utah Library Association Conference next year, which is very exciting. We also planned out the process for testing the material with users; Shauna put me in touch with two volunteers whom I will meet with next week. While I will ultimately want to meet with a learner in the future to test the material, the volunteers are an excellent source of feedback as they work with the learners on a one-on-one basis as a technology mentor. Their input is very valuable for improving this project. To finish the information literacy basics unit, I created an exploration activities that examine the first page of results from a Google search, and the different types of content that can appear, and advanced search strategies. The callouts on the image are the search box, the map, ads, recently viewed results, and search results. The content activity explores Image results, Videos, Shopping, News, and “More”. The advanced search strategies looks at how to fill out an advanced search request. I met with the first volunteer with whom I will be conducting some user testing with. I explained the objectives of the user test and how we would go out conducting the test. I am using the Think Aloud Protocol for my user tests. The Think Aloud Protocol is fairly simple - the test participant articulates what they are doing and their process for doing it outloud while working through the test questions. The insights from this test were fantastic (I happened to get lucky enough to meet with someone who understands user experience) and there are several opportunities to improve parts of the modules - such as adding a whole new module on working with and managing passwords. The volunteer has been a technology mentor in the past and was able to identify the pain points of the old material and how the new material can improve the learning experience. I met with the second user test volunteer today. While many of the insights mirrored those of the first volunteer, I was able glean several unique tips about how this content can improve to be the best learning experience possible. The volunteer had some ideas for making the navigation more intuitive - while I agree with these insights, I am working with a program that is unfortunately a little restrictive with some of the built in features (such as navigation). I will however add some additional text (or maybe some gifs/videos) to help guide learners through the modules. This volunteer had the same suggestion as the first volunteer - to create a module dedicated to passwords. Just from speaking with the two test participants, it is clear that managing passwords is a huge pain point for many library users, not just learners who are using the digital literacy courses. I would like to make the course on passwords a standalone course that any library user can access. I am finalizing the last week’s worth of content for the digital literacy initiative courses. The last few lessons I am working on deal with Google Docs and the myriad of ways to use Google services, such as Google Calendar, and storing items on the Google Drive. Week 3 has three different assignments for learners to complete: creating documents and storing them on Google Drive, completing at least 2 Google searches (for example, they could search for information about a store, a restaurant, or a job), and to explore the other course offerings through the International Refugee Committee (IRC) - one of the sponsors of this project, the Salt Lake City Public Library - the host of this initiative, or the Department of Workforce Services. Learners are encouraged to create one learning goal to further their personal development. I am beginning the process of wrapping up this project! I spent the majority of my time today cleaning up some of the courses, replacing photos, rephrasing certain sections, etc. I am an admitted perfectionist, so this project will never seem “ready” to me, but it will have to be released sometime! As I continue to volunteer with the library, I imagine these courses to go through continually edits, especially as more and more learners interact with the material and we can identify ways to improve it. I also have plans to create some additional stand alone courses (such as the course on managing passwords) that I will begin to work on after the completion of this internship. Today is my last day - wow! I finished wrapping up my project today (final edits, photos, etc). There was definitely a time (probably around mid-February) when I wasn’t sure if I was going to get all of the material converted to the new eLearning format and complete user testing by the end of my MLIS internship. As it stands, most of the suggested edits that were the result of the user testing probably won’t come to pass until after the internship (this is my last day after all). I am surprised (in a good way!) that it all managed to come together as well as it did. The objectives for this internship starting out fairly broad; I had proposed a few different projects that I felt capable of completing thanks to the courses I had taken during my MLIS. The instructional design project ended up being the bulk of my work here, and I am so glad that it did. I am very proud of my work during this internship, and especially pleased with the finished project. As I mentioned in my last post, I am planning to continue working with the library on this digital literacy initiative. I am so happy for all of the connections I have made at the library and for this amazing project that I truly hope will help someone learn such complex topics in a simplified way. Not only did the finished project turn out to be better than I could have hoped for, but the librarian I collaborated with during this project (Shauna Edson) and I are planning on presenting this project during next year's library conference here in Utah. (I think I mentioned this previously in the log but it bears mentioning again.) In many ways I’ll miss my hours spent at this beautiful library, but am also happy to have my nights and weekends back (for now! ).